Several years ago, a reader named Erin sent in a recipe for dairy-free triple chocolate brownie cookies. She said, “I found this recipe while searching for a GOOD chocolaty treat, and just tweaked the ingredients to suit my needs. 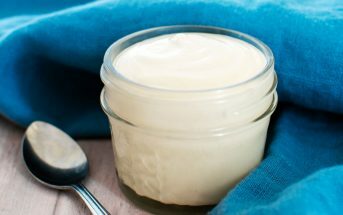 I am soy-free in addition to dairy-free, so a butter substitute such as margarine could be used in place of the shortening.” I recently tested out Erin’s recipe, and made a few more tweaks myself! I also tested it with both wheat flour and gluten-free flour for more options. And I took some photos to show you the delicious results! I stuck with Erin’s decision to use a non-hydrogenated shortening in these triple chocolate brownie cookies, because I find that it holds up better in dairy-free cookies whether their baked at low or high altitude. Buttery spread contains both oil and water, so separation can occur and result in a greasy cookie. I think that coconut oil might work in place of the shortening (I used Nutiva, which is a palm-coconut hybrid), but I haven’t tested it yet. Some of you might be concerned about chocolate, but dairy-free chocolate is a real thing! To help in selecting chocolate chips, see my Dairy-Free Chocolate Chips Guide. Unsweetened chocolate should be dairy free by ingredients, but some brands are made on shared equipment with milk. I like Hershey’s Unsweetened Chocolate Baking Bar and Sharffen Berger Unsweetened Dark Chocolate Bars, both of which are certified kosher parve. 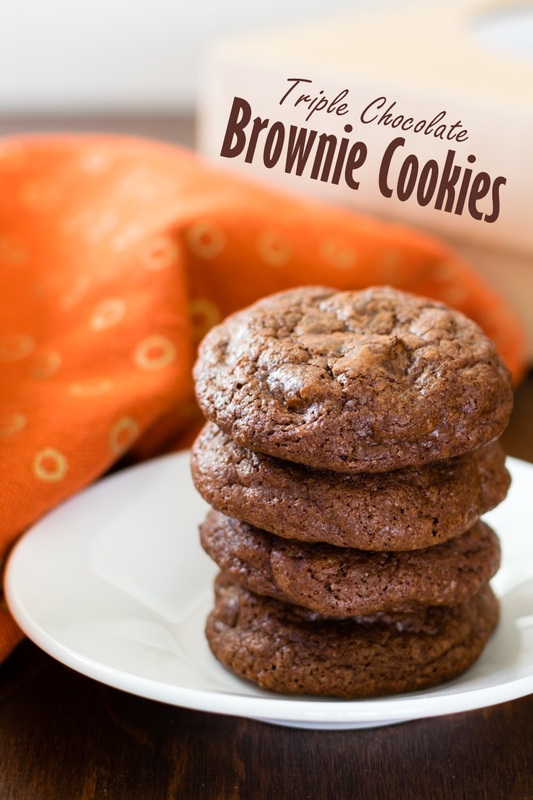 For vegan and egg-free cookies, I recommend enjoying the Fudge Brownie Cookies in my book, Go Dairy Free! 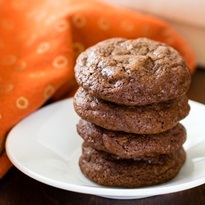 I also have a delicious recipe for Double Chocolate Orange Vegan Cookies online. This recipe was originally shared with us by a reader named Erin, but I've made a few modifications. I increased the flour a touch, tested it gluten-free, added vanilla extract, and changed several of the steps. I baked this recipe at high altitude (4500 feet), so it has been tested at high altitude, too! Put the flour, cocoa, baking powder, and salt in a medium bowl, and whisk to combine. Put the chocolate and shortening in a microwave-safe bowl and microwave on high for 1 minute. Whisk the chocolate well. If not fully melted, heat in 15 second intervals until just melted. Do not overheat the chocolate. Put the sugar, and eggs to a large mixing bowl, and beat with a hand mixer for about 1 minute, or until combined. Add the melted chocolate mixture and vanilla, and stir to combine. Add the flour mixture and stir to combine. Fold in the chocolate chips. Shape the dough into 1-inch balls, and place them about 2 inches apart on your baking sheet. Bake for 8 to 10 minutes, or until they look just baked on top. Let cool on the baking sheet for 2 minutes before removing to a wire rack to cool completely. If using gluten-free flour, you might need to let them cool for 5 to 10 minutes on the baking sheet before attempting to remove them. Store in an airtight container at room temperature for up to 3 days. Freeze the cookies to enjoy them later. Optional Topping: Melt ½ cup semi-sweet chocolate chips with 2 teaspoons shortening in a microwaveable bowl, stir until smooth. Drizzle over cookies. Let stand for 30 minutes or until chocolate is set. 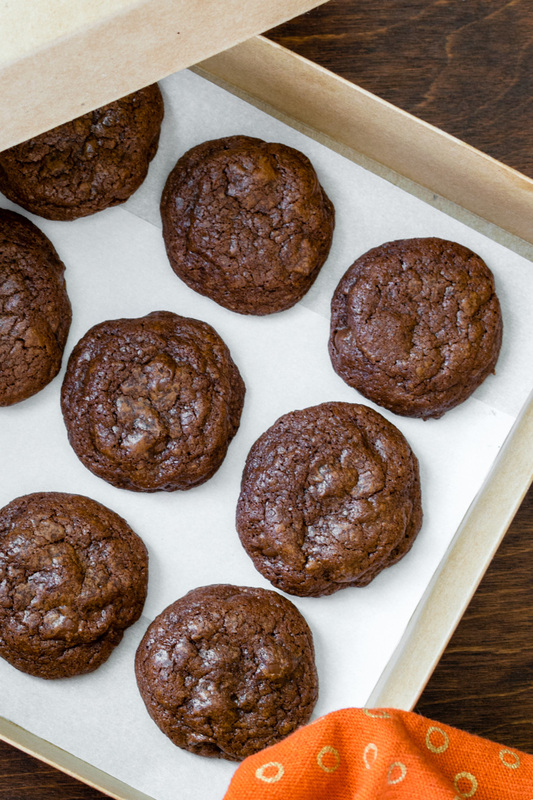 Pin these Dairy-Free Triple Chocolate Brownie Cookies! Want More Recipes? Enjoy My Cookbook Eat Dairy Free! Trying to really cut my sugar intake. What would you suggest? I have most of all the subs. That’s a tricky question since I’m not sure if you mean trying to cut sugars or trying to cut refined sugars. 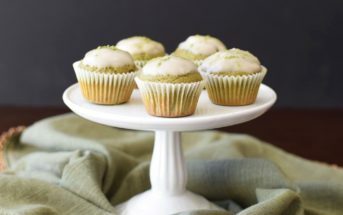 I don’t typically work with sugar-free substitutes, but I know some people use sugar-free baking blends with good luck. I was just wondering if I used the enjoy like dairy free semi sweet chocolate chips to replace the chips and block chocolate would it still turn out the same? Enjoy Life will work great for the chocolate chips! But swapping in the chips for the unsweetened chocolate would change the recipe a bit. You might be able to just reduce the sugar, but it might need some other alterations, too, since it would also be lower cacao and lower fat. Triple the chocolate = triple the decadence. Yummmm! Two of my favorite words: chocolate and cookies! Perfection! These look so rich and delicious! I love how they stay nice and thick and don’t flatten out. These would be gone in a second in my house! Those look to die for! The texture looks perfect, and your right- its always nice to have a delicious dairy-free chocolate treat! Those look so fudgy and crispy on the outside. A glass of dairy-free milk is just calling out this cookies name!